Welcome to Day Twenty-Four of Fiction University’s Month-Long Revision Workshop. Over the last twenty-three days we’ve been working on the larger revision issues and ignoring the specifics of the text (in most cases). Our stories are now solid, our structure and various story arcs are sound, and our scenes flow smoothly from one idea to the next. The novel is “done,” and we feel comfortable that it’s good and well-written. Now it’s time to polish our literary jewels until they shine, so roll up those sleeves and let’s get into the nitty gritty of the individual word choices. 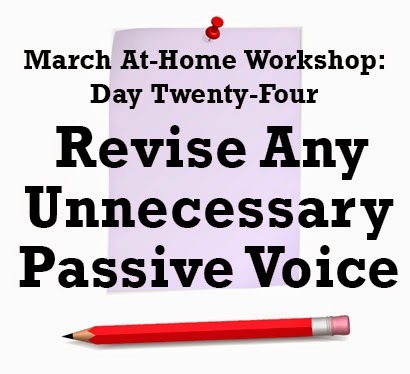 Today, we’re going to get active and revise any unnecessary instances of passive voice. Bob is the subject here, but Bob doesn't do anything (except maybe stand there like an idiot) and the zombie bites him, thus acting upon him. In active voice, the action (the biting) is done by the subject. Sometimes that requires changing the subject of the sentence. The easiest way to find passive voice, is to look for "to be" verbs: is, am, are, was, were, be, have, had, has, do, does, did, has been, have been, had been, will be, will have been, being. While using a to be verb isn’t passive on its own, these verbs are frequently found within writing using the passive voice, especially when paired with a past participle, such as: “Bob was greeted by the nurse” vs. “The nurse greeted Bob.” “By” is another red flag word often seen mixed in with passive voice. Do a search for these red flag words and look at how they're used in each sentence. Determine if the subject is acting or being acted upon, and rewrite any passive sentences that don’t need to be passive. Sometimes, the passive voice is exactly the right thing for the sentence, so don’t feel you need to change every instance of it. After today’s session, the manuscript as a whole should feel more active and immediate, which should draw readers in faster and keep them reading longer. Next, we’ll take a look at cliches and purple prose. Janice, thanks so much for all this great information. I haven't been commenting, because I've been swamped, but I've been reading the posts and following along. It's been such an excellent resource. Most welcome, and no worries, I've noticed the amount of comments has dropped as the workshop has gone on, so you're not alone there :) It's a lot of information to juggle. Glad it's been helpful!